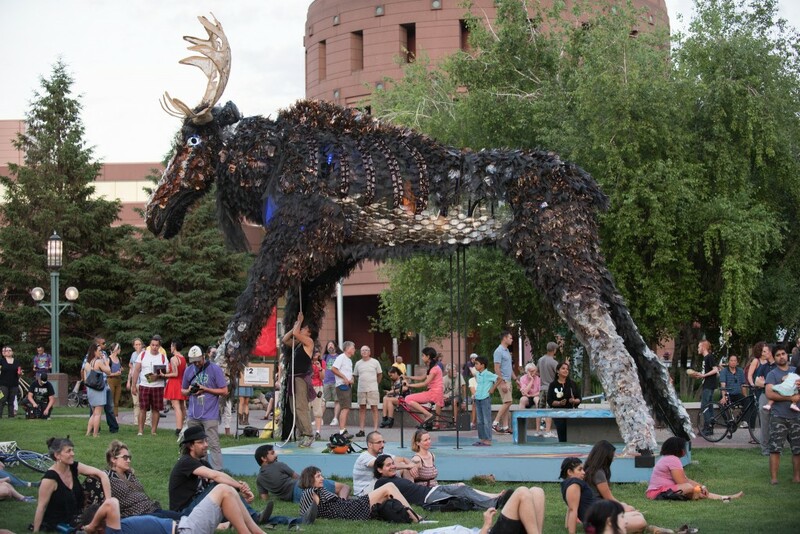 Wolf and Moose—2016 Creative City Challenge winner—beckons to the child in us all to play, to pedal, to wonder, and to reflect on our place as humans in the natural order. As the age of climate change unfolds, let us turn to the animals with renewed appreciation of all that we have learned from them and all that they have given us. Feel a revived reverence for their keen powers of awareness and sense of living in balance with Nature. Let Wolf and Moose inspire those who visit to seek out ways to lighten their footprint upon the Earth and live in greater harmony with other living things. May we live more simply and sustainably, seeking ways to reduce our pollution of the air and water. May we be more aware of the flow of material resources and seek to consume and waste less. May we remember that all beings are interconnected and that we owe our existence to the great living organisms of the Earth. Remember that the Wolf showed us the way and the Moose sustained us. Without them, we would not be. May the Moose thrive and may the Wolves run! Wolf and Moose on Facebook. 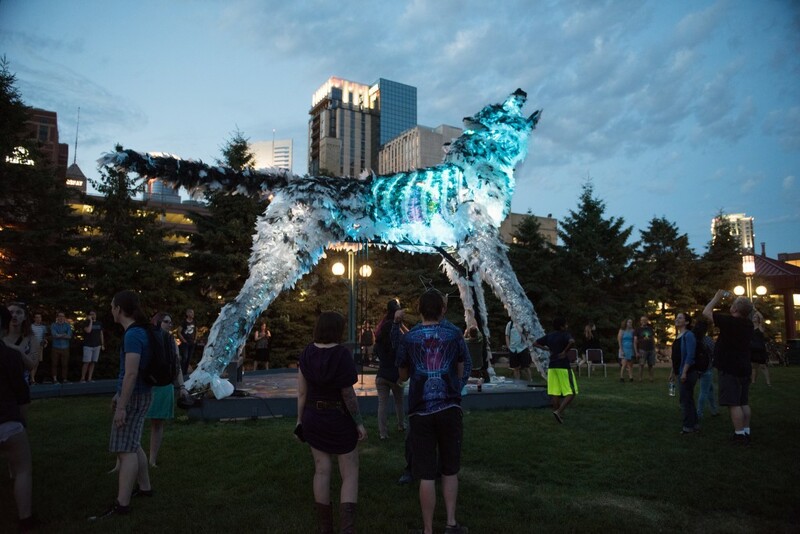 The Creative City Challenge is a competition for Minnesota-resident architects, landscape architects, urban designers, planners, engineers, scientists, artists, students and individuals of all backgrounds to create and install at the Minneapolis Convention Center Plaza an artwork, which is an innovative use of the space and acts as a sociable and participatory platform for scheduled and impromptu onsite programs throughout the summer. Creative City Challenge is presented by Minneapolis Convention Center, and the Arts, Culture and the Creative Economy Program of the City of Minneapolis, in partnership with Northern Lights.mn and Meet Minneapolis. Christopher Lutter is a designer, inventor, and community educator who produces art predominately from waste stream materials exploring the unique potentials inherent in the material. 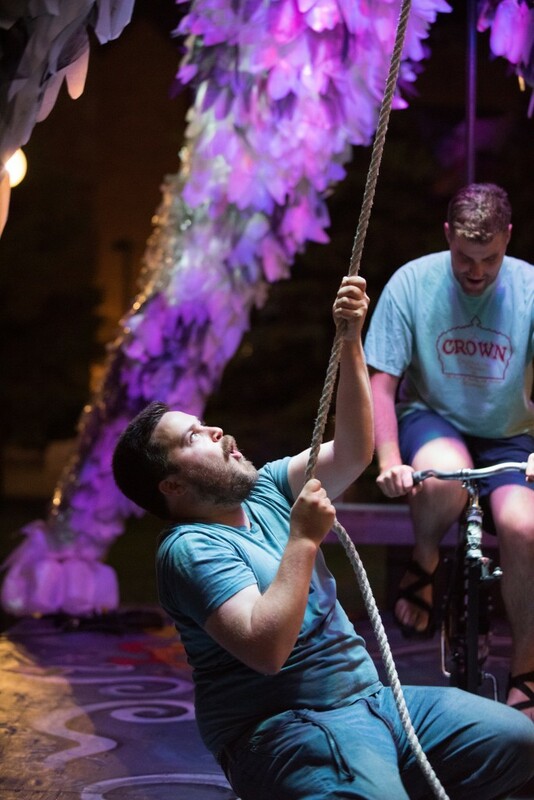 Chris works to inspire and facilitate original thinking in the realms of theatrical, educational, and public-art design. A deep emphasis is placed upon eco-consciousness, resourcefulness, integration, and improvisation. Heid E. Erdrich is a poet and interdisciplinary collaborative artist who creates poetry films, installations and performances. She teaches the MFA Creative Writing program at Augsburg College. Coal Dorius graduated from University of Minnesota with a Masters in Landscape Architecture and a focus on urban planning. 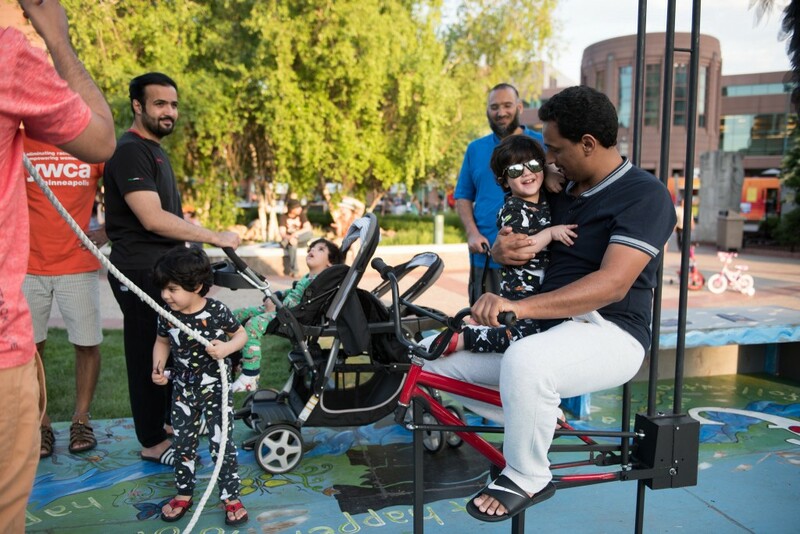 Her current work with Juxtaposition Arts allows her to create spaces that are more usable, safe, inclusive, and healthy in response to the needs of an increasingly diverse population. 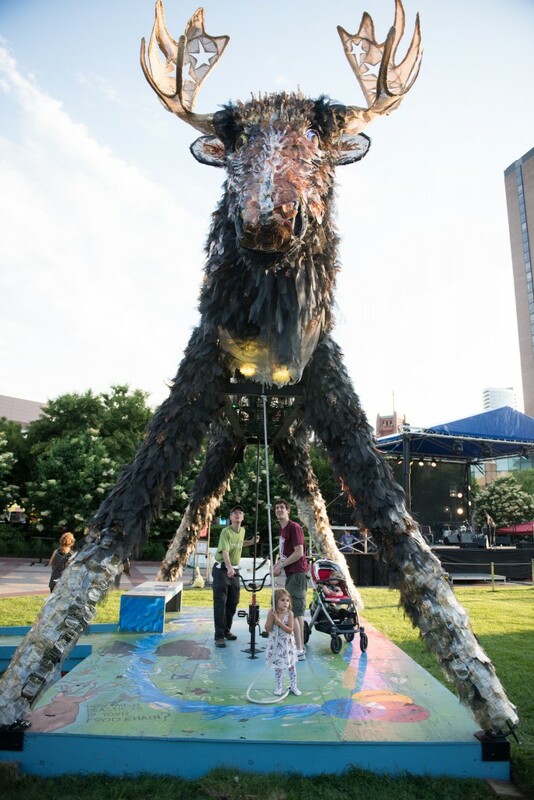 Kim Ford strives to create reality engineered from creativity, salvaged materials and dreams. Paul Tinetti began custom fabricating furniture upon leaving the army in 1999 and in 2010 started Tinetti Fine Furniture, which specializes in commercial and residential furniture as well as architectural metals. Karl Stoerzinger has a passion for all things related to bicycle engineering, midnight machining, and designing human-powered contraptions. Ian Knodel is a lighting and projection designer working in theatre, dance, corporate theatre, live music and interactive marketing throughout the country. Team Credits: Missy Adzick, Project Manager; Carl Kragh, Widget Wizard. 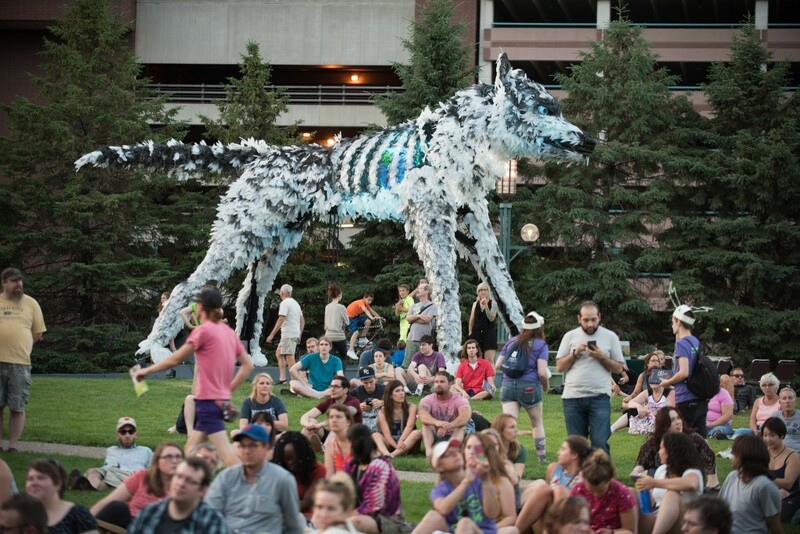 Wolf and Moose is presented by Minneapolis Convention Center, and the Arts, Culture and the Creative Economy Program of the City of Minneapolis, in partnership with Northern Lights.mn and Meet Minneapolis. 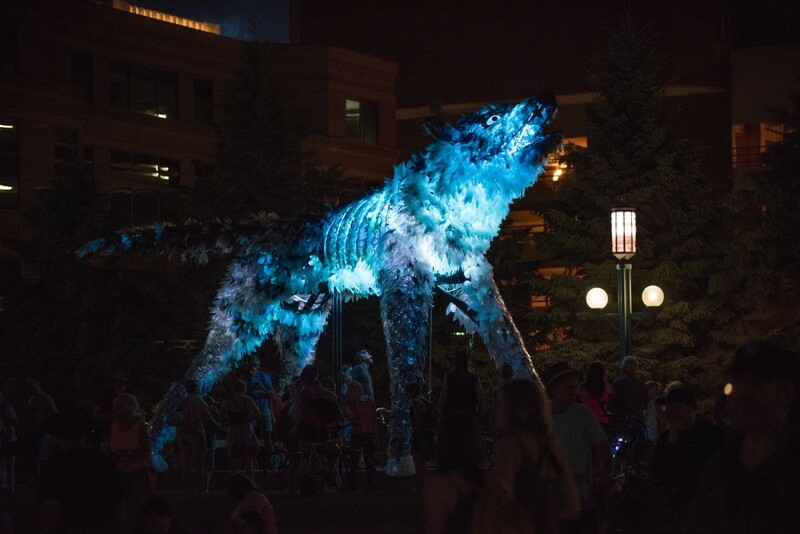 View more photos from Wolf and Moose on the Northern Spark Flickr here!